Time to wrap up a Yellow Christmas with one more giallo film. This week on episode 435 of the Dread Media podcast, I take a look at Dario Argento’s Phenomena, better known in America as Creepers (1985). Jennifer Connelly and Donald Pleasance take a spin down Giallo Lane in this odd little flick. Check out the trailer on YouTube, then track down the original and unedited version. Special thanks to Desmond over at Dread Media and all the listeners for a fantastic 2015. Things will be bigger and better in 2016, so keep listening…and tell them Monster Movie Kid sent you! Christmas 2015 is upon us and it’s time to wrap up the 4th Annual Countdown to Christmas. Every year since 1989, I take an hour to sit down and listen to my favorite classic radio show adaptation of Charles Dickens’ A Christmas Carol. I’ve always loved the 1939 Campbell Playhouse version with Lionel Barrymore and Orson Welles. However, this past summer, I discovered a record from 1960 featuring an audio recording starring Sir Ralph Richardson that just may rival it for my time. This version is really quite excellent and I’m surprised it flew under my yuletide radar for so many years. 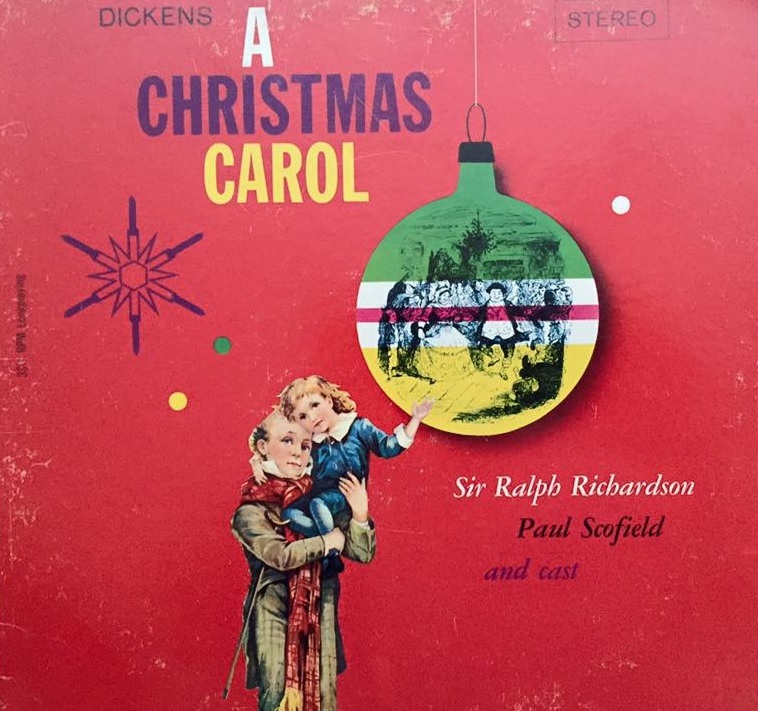 Narrator Paul Scofield is amazing and Sir Ralph Richardson turns in a masterful performance as Scrooge. Best of all, much of Dicken’s true vision of the story is retained here. With wonderful sound effects and background music, it draws you into the world of the past and allows us to imagine Ebenezer Scrooge as he was truly meant to be. Radio station WFMT in Chicago has reportedly been playing this on Christmas for decades and this year is no exception. However, you can listen to it right now as the complete recording is currently on YouTube in eight parts. So, put another log on the fire and settle in for my favorite tale of the Christmas season. Merry Christmas and Happy Holidays from Monster Movie Kid! There are several factors that go into adapting Charles Dickens’ A Christmas Carol that help elevate it cinematically. First is the proper casting of key roles such as Ebenezer Scrooge and Bob Cratchit. Another would be location shooting in London or having sets that bring you into the moment and surroundings. For me, having a weak lead role or a sound stage that is too brightly lit can pull me out of the moment. That’s why MGMs 1938 version has always been one of my least favorite adaptations. So when I heard that General Patton was playing the role back in 1984, even then at a young age, I was skeptical whether or not he could pull it off. Admittedly, the key reason at the time that I was interested in watching it had to do with my growing love for all things Doctor Who. When I heard that Mark Strickson, who played the Doctor’s companion Turlough, was playing a young Scrooge, I was intrigued. Needless to say, I was a little disappointed that his role was so small. 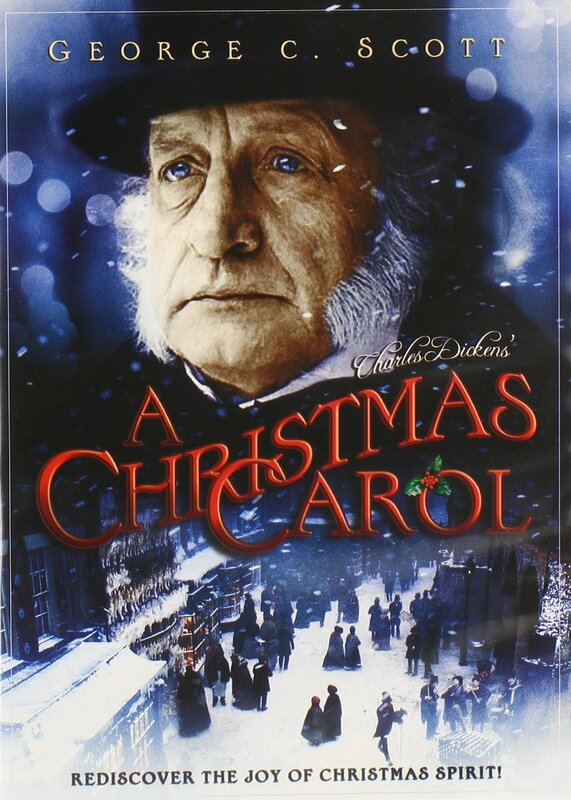 My attention was drawn instead to George C. Scott’s portrayal of Scrooge himself. 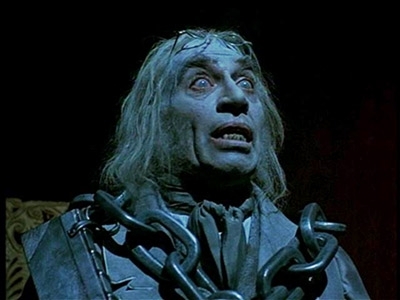 It is that performance that makes A Christmas Carol (1984) one of the best adaptations. Scott brings a gruffness to any role he plays, so he seems perfect to play Scrooge and he does so rather well. He lacks the appropriate amount of love and passion prior to his conversion and redemption. While he still seems rough around the edges, I found the moment where Scrooge visits his nephew Fred and his wife at the end especially heartwarming. Scott wasn’t the easiest actor to work with and he had a certain measure of decorum to any role he played, so you won’t find him running about in his pajamas here but it does not detract from a wonderful performance. Scott displays a certain measure of sadness in eyes as Scrooge begins to see the folly of his ways that he seldom brought to any role. 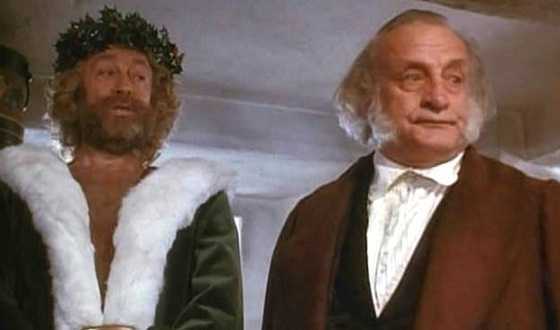 While Scott is not my favorite Scrooge, he far surpasses many others in my opinion, including Reginald Owen and Seymour Hicks. Being filmed on location in London adds some authenticity that elevates the film above many other versions. There is a dirt and grittiness to the city without making it too dark and gloomy. While the sets seem a little more limited than other versions, they work quite well. I found the representations of the Ghosts of Christmas Past, Present and Future quite fitting, especially the use of lightning and screeching sounds for the Future segment, something unique to this version. 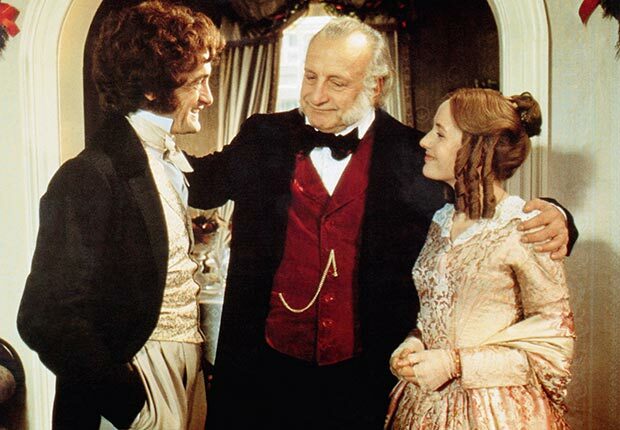 It was also interesting to see the character of Silas Scrooge, Ebenezer’s father, the first time we would see him on screen. The ghostly carriage was also a chilling addition. However, I did miss the reduced role of Mrs. Dilber and I didn’t particularly feel that Marley’s ghost was very outstanding, at least when compared to other versions. The biggest drawback for me was the horrible miscasting of Bob Cratchit. David Warner (Time After Time) is a wonderful actor but his performance seemed too upper society for me. I wasn’t convinced of Cratchit’s lowly status or his meek persona around Scrooge. Nor did I get a very good feeling of his love for his family. Again, nothing against Warner as an actor, I just feel he was entirely wrong for the role. I was also bothered by Tiny Tim as Anthony Walters almost looked too sickly in appearance. It was perhaps authentic on one hand but a little too much for me. Despite, these few flaws, this 1984 film version is well worth enjoying during the Christmas season. Made-for-television for the United States, it was screened theatrically in the UK, indicative of its superior quality. After years of limited availability, it is now easily found on Blu-ray. While it is not my favorite version, it ranks towards the top and is something I go back to every few years. If you haven’t given it a chance, take the time to do so this Christmas. Every Christmas season, I try to discover some new hidden gem that was best left forgotten in the back of the holiday closet with the unused bows, broken ornaments and strands of annoying tinsel. Several years ago, I discovered one such flick and decided to revisit it this year for Monster Movie Kid. Behold this year’s treasure known as Le Martien de Noel aka The Christmas Martian (1971). Okay, treasure is a word that should never be used with this hour-long journey. The Christmas Martian is a French Canadian movie clearly designed for children. Some sources credit it as being the first independently made feature-length Canadian children’s film. That said, how many other such films have been made? Probably more than most of us know or remember. The plot is simple enough as we have a Martian (Marcel Sabourin) visiting a small town in Quebec. His saucer, which looks straight out of Plan 9 From Outer Space, is need of some repairs and he is also exploring Earth as his people believed the planet to be deserted. As he travels throughout town, innocently spreading panic amongst the townsfolk of little green invaders from Mars, he becomes friends with Cathy and Frank. The Martian sports one of the most unique visions of our intergalactic neighbors I’ve ever seen. 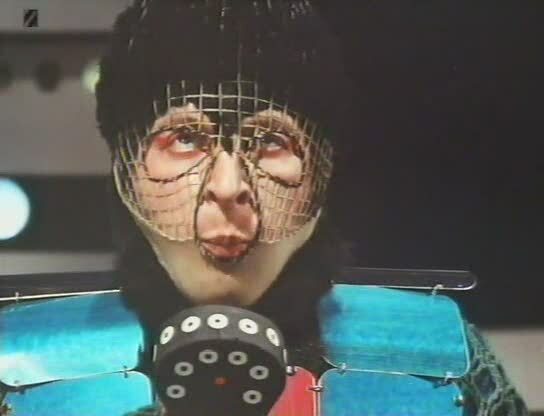 He is wearing some type of scuba diving suit with a multi-colored vest and an odd fishnet. Most of the movie deals with silly sequences in the snow and random conversations between the Martian and the children. Once he gets the saucer moving again, he takes them for a ride and, courtesy of some various stock footage, we see various places around Earth, such as the North Pole and the Sierra Desert. The children see his innocence but once the townspeople discover the rumors of invaders are real, they decide to seek out the alien and kill it, as most smallminded humans usually seem to do. This little film might have been better if it would have about half the running time. It reminded me of some of those foreign films that always popped up on the CBS Children’s Film Festival on Saturday mornings with Kukla, Fran and Ollie. It suffers from a nonsensical script written by Roch Carrier and the haphazard directorial style of Bernard Gosselin. However, since neither of them was an experienced filmmaker and they reportedly ran out of money before finishing it, the end result is a bit of an odd mess. The cast is mostly actors who never made another film again. The one exception being the Martian himself, Marcel Sabourin, who is a well accomplished actor. His American credits include The Sum of All Fears (2002) and The Hitman (1991). 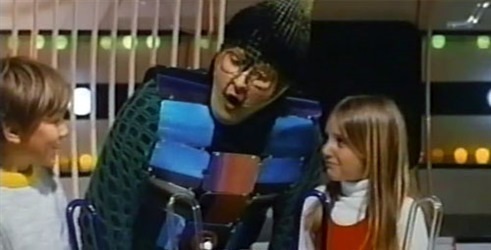 He is also well-known for several Quebec children’s TV shows. 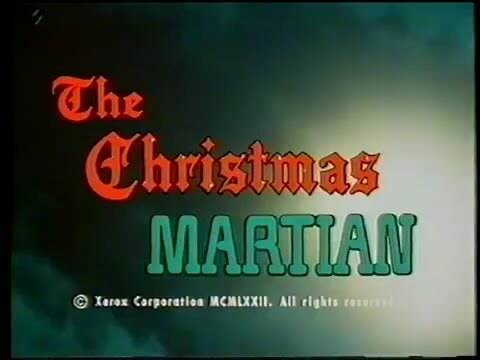 The Christmas Martian won’t surpass other Christmas oddities like Santa Claus (1959) or The Magic Christmas Tree (1964) on the so-bad-it’s-good scale but the cheap special effects are fun to laugh at. Just brace yourself for one of the most horrendous end title theme songs you’ll ever hear. If you’re looking for something different to watch this year and have an hour to kill, you can watch the film on YouTube. It’s better than your aunt’s fruitcake…but not by much. All things giallo are being celebrated over at the Dread Media podcast in December and on this week’s episode 434, I am taking a look at the cult classic Black Belly of the Tarantula (1971). Either buy the DVD or watch it on YouTube before listening to why this movie has become one of my favorite first-time viewings of the year. Mixing a horror film with comedy is not an easy task. Throw in a little holiday joy and your chances at success are slim. However, this season we’ve been dealt just that with Krampus (2015), a bold attempt at bringing the legend to life in a whimsical way with just a dash of Bing Crosby. Surprisingly, the results are quite good. Before I discuss the new movie, I think a brief history lesson of just who Krampus is may be in order. Now, its true origins are debated but it is believed to date as far back as pre-Christian paganism, most likely with its roots in Germany. Krampus is a horned and hooved beast with a long tongue that punishes misbehaving children. He carries chains, sometimes with bells, that some believe to represent the binding of the Devil. Essentially, the total opposite of good ol’ Saint Nick. At one point, Krampus was a forbidden subject in many parts of Europe. However, at the turn of the century, Krampus resurfaced and is, perhaps, more popular now than ever before. 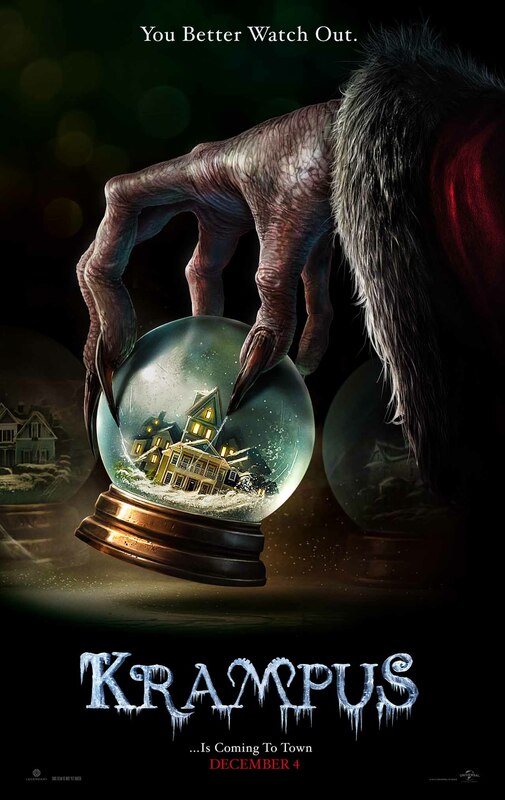 Krampus (2015) is the most publicized of films based on the legend released in the last several years. No less than five other films have been released with at least another two planned for next year. However, this flick from Universal is the biggest yet with a notable cast and a budget to back it up. Rather than go with a full-fledged horror movie, director and writer Michael Dougherty (Trick ‘r Treat, X-Men: Apocalypse) opted to throw in a little humor. This proved to be the smart move as straight horror films tend not to do very well during the holidays. 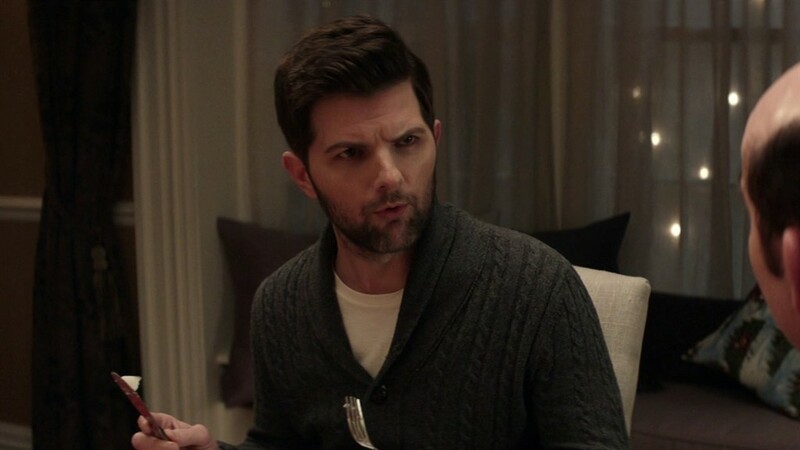 The cast has some recognizable actors, such as Adam Scott (Parks and Recreation) and Toni Collette (The Sixth Sense) who star as Tom and Sarah Engel, a couple who have drifted apart. Their children are Max, who still believes in Santa Claus, and Beth, who is more interested in spending time with her boyfriend. Of course, the holidays wouldn’t be complete without a bunch of unwanted visiting relatives. You have the lecherous and overbearing Howard (David Koechner, Anchorman) and his brood, along with the politically incorrect Aunt Dorothy (Conchata Ferrell, Two and a Half Men). A typical dysfunctional lot that push young Max over the edge, resulting in him tearing up a letter to Santa. Unfortunately, that act unleashes Krampus and opens the gates for hell on Earth. In quiet observance of the holiday mess is Grandma Omi (Krista Sadler). She has witnessed the terrors of Krampus before and knows what is coming. The backstory between Krampus and Omi is told through an interesting animated sequence that is a highlight of the film. She tries to protect the family but they have sealed their own fates. When an epic winter storm traps the family at home, what follows is a series of murders from killer gingerbread men, an evil clown headed jack-in-the-box and a crazed teddy bear. And, of course, elves. Just don’t expect Hermey to show up and sing songs about becoming a dentist. I found Krampus to be very entertaining. It was scary without the gore, which some will argue is needed but I felt it was fine without it here. There is plenty of humor to lighten the mood as the family is picked off one-by-one in a warped cat and mouse playful way. And Krampus is particularly evil looking. He is described as Saint Nicholas’ shadow, only coming into full display during the final confrontation with young Max. His face is never revealed, hidden by a particularly disturbing Santa Claus mask. The ending is up for interpretation. Was it all a dream? Were they all saved after learning their lesson? Or are they all trapped for eternity in a snow globe under the watchful eye of Krampus? It’s up for you to decide. 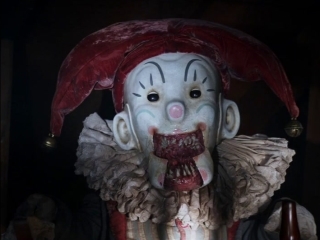 If you want something a little different this holiday season, watch the trailer for Krampus then head out to the theater. I enjoyed it and I think you will too. The Christmas season is full of regrettable television specials. Most are viewed once and never heard from again. 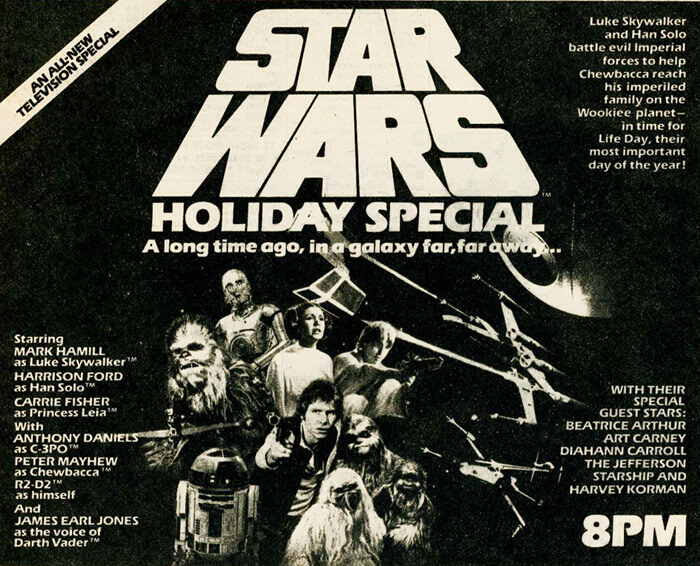 But none are as notorious as the infamous Star Wars Holiday Special. Aired only once on CBS in November 1978, this little nugget of Star Wars lore is the one thing George Lucas prefers to be buried and forgotten. If you’ve never had a chance to see it, count yourself lucky. That said, it is also required viewing for any Star Wars fan. 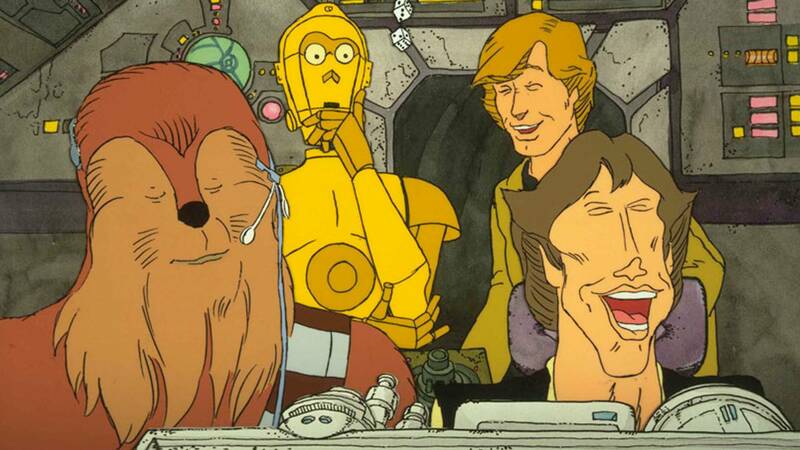 It is set in the time between Episode IV A New Hope and Episode V The Empire Strikes Back. But, it really doesn’t make any reference to events in either movie. 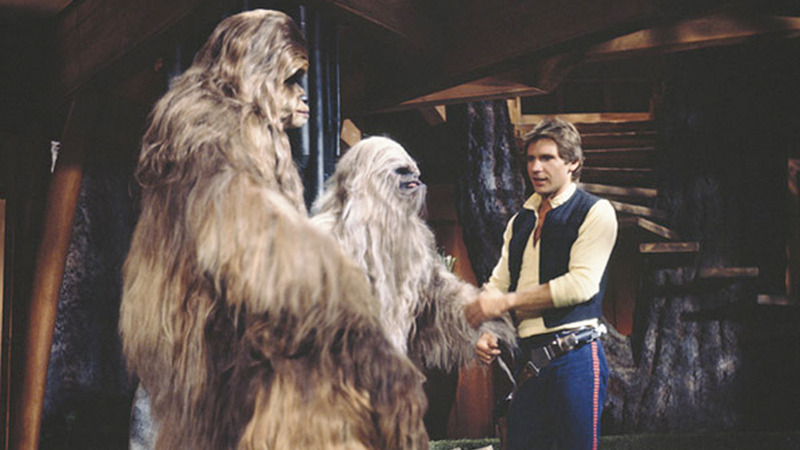 It reunites the key characters of Luke (Mark Hamill), Princess Leia (Carrie Fisher), Han Solo (Harrison Ford) and Chewbacca (Peter Mayhew), not to mention C-3PO (Anthony Daniels) and R2-D2 (Kenny Baker). Oh sure, Darth Vader is there too but in recycled footage from Star Wars (1977). The rest are all new characters that, thankfully, were all one and done appearances. Bea Arthur (yes, the Golden Girl herself) is featured in the Cantina reunion scene, probably one of the better sequences despite her singing. Art Carney is Saun Dann, a trader and, admittedly, he doesn’t do too bad. Then, we have Harvey Korman. Harvey always makes me laugh but his sequences here are just so out-of-place in the Star Wars universe that they are painful. At least he comes off a little better than Chewbacca’s family, Malla, Itchy and Lumpy. They were never mentioned before or ever again. The special is a train wreck of epic proportions. From Carrie Fisher’s drugged out appearance and painful musical number to Mark Hamill wearing eye shadow (reportedly to help cover up his recovery from a car accident, of which there are a million theories), the characters do their best with what is given to them. Harrison Ford is fairly good, although he looks bored and uninspired. Did I mention the musical numbers? Yes, we also have songs from Diahann Carroll and Jefferson Starship. And that is all that needs to be said about that. The only good part of this special is the animated sequence with Boba Fett. Boba Fett had not yet appeared on screen as his footage was cut from the original print of Star Wars. This was his debut and the short story is actually entertaining. Other than the nostalgic fun of watching old commercials, which are intact in some bootleg prints, this is the sole saving grace of the Star Wars Holiday Special. George Lucas would love if this special just disappeared. In fact, it did after its’ original airing. However, by the 1990s, VHS copies began to surface and they haven’t gone away since. Currently, the special is available on YouTube minus the animated sequence and commercials. However, you can see Boba Fett and the commercials separately, if you so desire. This is mandatory viewing this holiday season, especially since there is another little Star Wars film hitting the theaters. I wonder if Itchy is going to make a special cameo appearance?